I'm disappointed right now. Very disappointed. Granted, this isn't an unusual state of being in my life but, dammit, I was really excited about this friggin' movie. Especially after its intriguingly weird trailer. I was sure I had something cool on my hands. Something unique. Something to make up for the subpar lineup that 2018 has been shelling out. But what did I get? A pretentious gore-fest that not even a crazier than usual Nicholas Cage could salvage. Ugh. Anyway. Here are my thoughts. After only a little while into this thing, I was already feeling like I was in for a good old fashion Lynchian experience. Something along the same vein as Lost Highway, perhaps, or that especially weird episode of Twin Peaks where the guy kept saying "Gotta light?" (I still don't understand what the hell was going on there). It had weird characters like that in it, ya know, with interesting faces that looked almost like horrifying caricatures of real life. Even the dialogue felt like a quirky David Lynch imitation; sometimes arbitrarily silly, sometimes pretentiously deep, but always with an included feeling that there was more to it than meets the eye... if only you were smart enough to puzzle it out. Suffice it to say, I was all in. To make matters cooler, the movie was also set in the 1980s, so it had a lot of those "Hey, look, we're like a real 80's movie!" hallmarks. It was grainy like those old flicks always were, Cage and his lady dressed like a couple of middle-aged Metalheads (Mandy seems to be wearing a rock shirt in every scene she was in), the synth music was aged to perfection, the setting looked exactly like Camp Crystal Lake from Friday the 13th (undoubtedly not coincidental, as Mandy even explicitly states that they live near Crystal Lake), everyone was smoking cigarettes, TV's still got staticky at night, every piece of furniture and appliance appeared to have wood paneling, the old car radio was yapping about Reagan, and, well, you get the picture. The eye for detail was fantastic and they got the atmosphere down pat. In a way, it was like a darker version of Stranger Things. But instead of paying homage Spielberg and Stephen King, they evoked the mood of B-grade slasher movies and heavy metal album covers. Once again, I was all in. Putting the cool look and atmosphere aside, the movie's story turned out to be shallow and simplistic. Apparently, all that foreshadowing of depth I was sensing in the beginning was merely a style-induced hallucination that was heading nowhere interesting (a realization I didn't fully come to until about 50 minutes in). Contrary to the mysterious vibe it gave off, the plot was as straightforward as it gets: Cage and his gal, Mandy, are a couple living in a cabin by the lake, he's a logger, she's a cashier/artist, one day they're abducted by a mini Manson Family-esque cult of weirdos, Cage's character escapes, he seeks revenge, and everything from then on out is just one over-the-top gory kill after another. There's no real look into the characters at all (they barely talk and there's zero backstory), there's nothing more meaningful to the plot other than what I've already said, and there's no surprises, twists, or turns at the end that make up for anything. It's just an angry guy going out for revenge and getting it. Death Wish had more depth to it. It was almost as if the creators just wanted an excuse to play with cameras, tone, lighting, and After Effects, rather than to actually make a good or interesting movie (either that or they just wanted an excuse to have a stupid chainsaw swordfight... yeah, that happens). The Lynchian vibes I was talking about earlier started to feel like the result of a film students fanboying attempt at trying to come off as a better artist than he is. The heavy-handed pointlessness of the 80's setting started to make me realize that they were only doing it because it looked cool. The characters felt weird just for the sake of being weird (and they were as one dimensional as it gets). And all the gratuitous violence made me feel nothing because, aesthetically, we've already seen it in a billion times other movies, and, emotionally, who cares when you do nothing to make us love, hate, or know the characters involved? What was the point of this? Every decision made felt like the result of the creators just thinking, "Hey, wouldn't it be cool if…[insert random teenagers thought]". Which, I'll give you, may have been cool if the movie was being honest about that intention (like Planet Terror, for instance). But it didn't feel that way. It felt like they trying to fool us into thinking there was more to this eye-candy than there really was. But, no. There was nothing more to it than that. Nothing that happened, no style given, felt earned. Any depth was just an illusion. There was nothing behind any of it other than the obvious desire to look cool and enigmatic. It was like bad poetry. Personally, I found it somewhat reminiscent of my high school days, when we'd see a privileged rich kid dressing like a grungy rocker or a goth. In a way, that's what this movie was like. A poser trying to trick us into thinking it was the real deal. The epitome of style over substance. Nevertheless, there was one redeeming factor. Nicholas Cage was awesome. 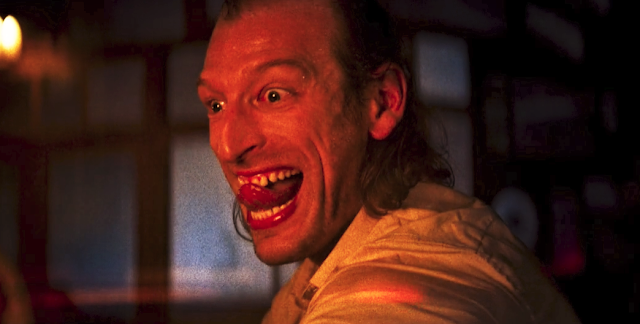 I don't know what it is about this man acting like a complete lunatic, but I absolutely love it (even in the crappiest of movies). Did his character here have any depth? No. Did he have a personality? Not really. But there's just something about how Cage does crazy that I adore. And this was him at perhaps his most craziest. And I couldn't help but smile at every weird exclamation, over-the-top outburst, and bizarre moment he was involved in. For instance: You see the picture up above? The one with Cage looking at the camera and smiling like a maniac while covered in blood? This was an actual scene from the movie. There was no good reason for it, it contributed absolutely nothing to the plot, and felt even more random in the movie than it does in the photo. But I loved it. That being said, you can see a crazy Nicholas Cage anywhere (literally, just pick one of his movies at random). So I still don't think I'd recommend this ridiculous and pretentious film. It's got great reviews elsewhere, though, so maybe I'm missing something. I don't know. If nothing else, you'll at least get to see two grown men duel it out with chainsaws. So if you come out of this as disappointed as I was, at least you won't walk away completely empty-handed.